Jump to video Does Hillary Clinton still want to be president? 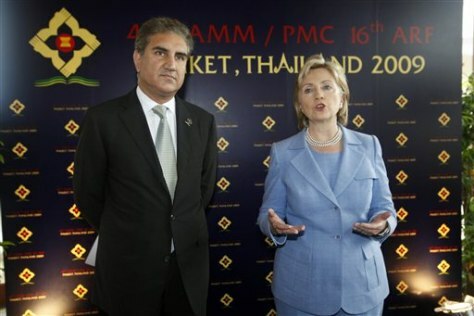 Secretary of State Hillary Rodham Clinton and Pakistan Foreign Minister Shah Mahmood Qureshi meet in Phuket, Thailand, on Thursday. A statement issued by North Korea's Foreign Ministry claimed that Clinton sometimes "looks like a primary schoolgirl and sometimes a pensioner going shopping."